St. Patrick’s day is right around the corner and it’s no surprise that everyone is always trying to out do each other with costumes and the amount of green they are wearing. 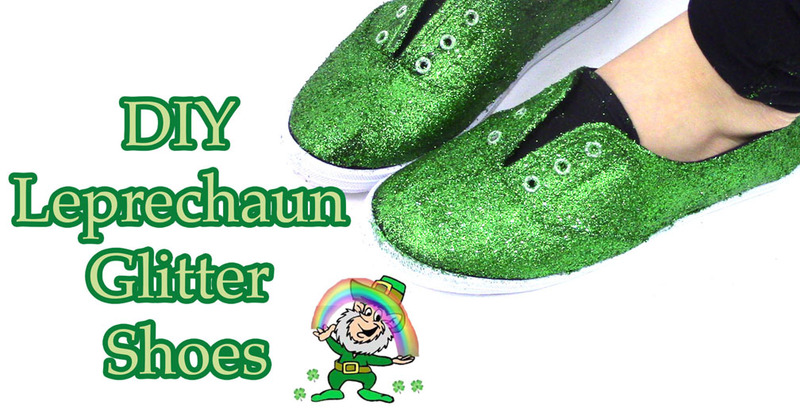 With that said, what better way to out do your friends then to turn yourself into a leprechaun with these DIY St. Patrick’s Day Shoes. This tutorial will show you a step by step guide in creating these one of a kind green glittered shoes. The tutorial is suitable for all ages but do suggest having an adult present as the glitter can get pretty messy. When creating these DIY St. Patrick’s Day Shoes, opt for using an old pair of runners you have lying around or head to your local thrift store as they will have lots of options for you at a decent price. Once you have the shoes completed, it’s time for an outfit! Pair your new amazing glittered shoes with a green blazer or green tights to achieve the full ‘leprechaun’ look. Click here for additional St. Patrick’s Day Outfit Ideas.